A pretty, compact, shrubby plant, woody below, about a foot high, with tangled branches, pale downy twigs, and thickish, dull green, downy leaves. 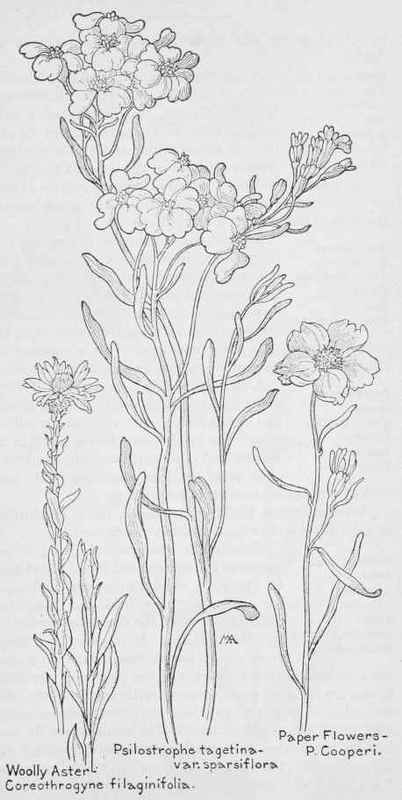 The pretty flowers are an inch and a quarter across, with an orange-yellow center and five or six, large, clear bright yellow rays, twisted to one side and puckered at the base, turning back and becoming papery as they fade. This plant is at its best in sandy soil and is very effective in the desert. When fully developed it is very symmetrical in outline, forming a charming yellow globe of flowers. There are several kinds of Xylorrhiza, nearly related to the Aster group and by some authorities regarded as Asters.